They teach Brazilian Jiu-Jitsu in the public high schools in Abu Dhabi. For boys its mandatory but for girls its an optional elective. BJJ Legends sits down with Priscilla Prandini one of the supervisors of the program to bring BJJ to UAE and Michelle Nicholini, 8 time world champion and Prandini’s coach. BJJL: I am here with Priscilla Prandini and Michelle Nicolini and we are going to talk about Jiu-Jitsu in Abu Dhabi for women. And my number one question is, isn’t there a lot of machismo in the United Arab Emirates? BJJL: In the UAE are woman allowed to walk around outside? Allowed to drive a car? Allowed to ride a bicycle? Priscilla: Yes, sure. There are somethings common in a country with Slavic foundation such as clothing etc but its not that bad, its just different from Western culture but you can adapt somethings like long sleeves. Its not allowed to go to the malls with some t-shirts that can appear your shoulders. But you can do everything here. BJJL: Do you have to wear a headscarf? BJJL: And is there a curfew? Priscilla: There are, but the most inside the hotels only for non Muslims. BJJL: What do you do in Abu Dhabi? Priscilla: Now am a supervisor. I arrived there as a coach. I stayed a coach two years and now I am supervisor responsible for 19 schools. Eight for girls and eleven for boys. I place the Jiu-Jitsu instructors in schools. I need to check everything, about paperwork that we have a lot, about classes. Each school has two coaches working there. So I need to check everything. BJJL: Are these coaches Brazilians? Americans? Priscilla: Yes, we have Americans, but most are Brazilian. BJJL: Europeans? Are there anybody from United Arab Emirates that teaches Jiu Jitsu? BJJL: Because the program is too new? Priscilla: Besides His Highness Sheikh Tahnoon, we have only one local black belt. Priscilla: Male. Female, the high belt that we have is purple belt. BJJL: Why do they teach Jiu Jitsu in the schools? Michelle: For self defense, the idea in the beginning was for self-defense, no? 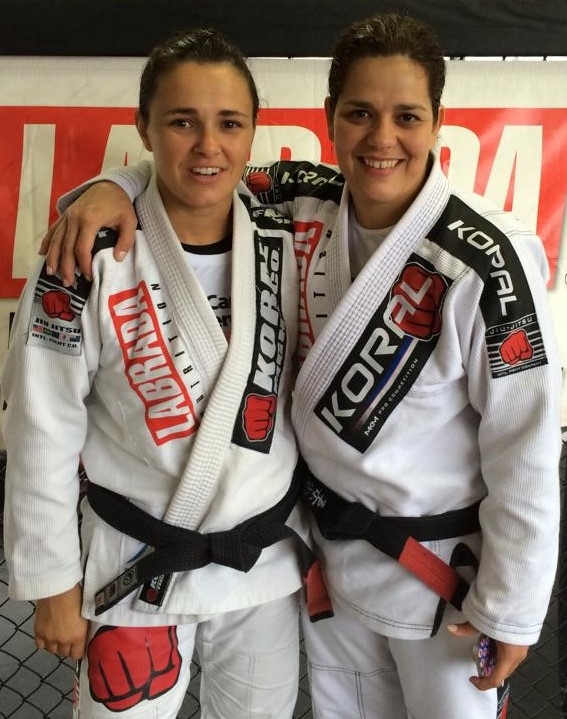 BJJL: Jiu Jitsu changed my life. It changed the his son’s life and now its changing Abu Dhabi. You’re in 19 schools teaching Jiu Jitsu, and is it modified or is it Brazilian Jiu Jitsu? Michelle: She only supervises 19 schools but there is much more. Priscilla: No not modified. Its Brazilian Jiu-Jitsu. Each tournament we bring around 900, 1000 children, kids to compete. We have almost one tournament a month. The acceptance of the program is great either for male and female schools. We are present in the entire Emirate of Abu Dhabi and growing every day. BJJL: The people that you are bringing to teach the classes inside the schools, what’s your requirements? How do you pick them? Priscilla: …but not so much. BJJL: I don’t even know the language in Abu Dhabi. What’s the language in Abu Dhabi? Priscilla: Its Arabic. Its great if the coach can speak English to communicate no just with students but also with school staff and the country generally. We exchange culture and knowledge learning some Arabic words too but we (Jiu-Jitus coaches) mostly spak English. BJJL: You personally, have you seen Jiu Jitsu change your students? Can you think of a story? Priscilla: Yes, everyon that gets involved in Jiu-Jitsu has their life changed somehow. There are so many schools so many stories but generally a change in behavior and the awareness of a healthy lifestyle are the highlights. Priscilla: They are very Competitive and they are getting tougher everyday. They train a lot and their technique level is increasing as they train. They love Jiu-Jitsu. We are lucky. You have never been there? Michelle: Yes, come. You are welcome. Priscilla: Can I add one more thing? I’d like to say thanks for my company PalmsSports for the support and my sponsor Koral.